Introduced in 2017, the standard Škoda Kodiaq has proven to be a spacious and practical SUV. It is based on VW Group’s modular MQB platform, which underpins the VW Tiguan Allspace and the imminent SEAT Tarraco, but the Kodiaq is longer than the Allspace and comes in a seven seat version. Since Škoda discontinued the Fabia vRS hatchback a few years back, the Octavia has been the only model to bear its performance badge. Until now, that is. 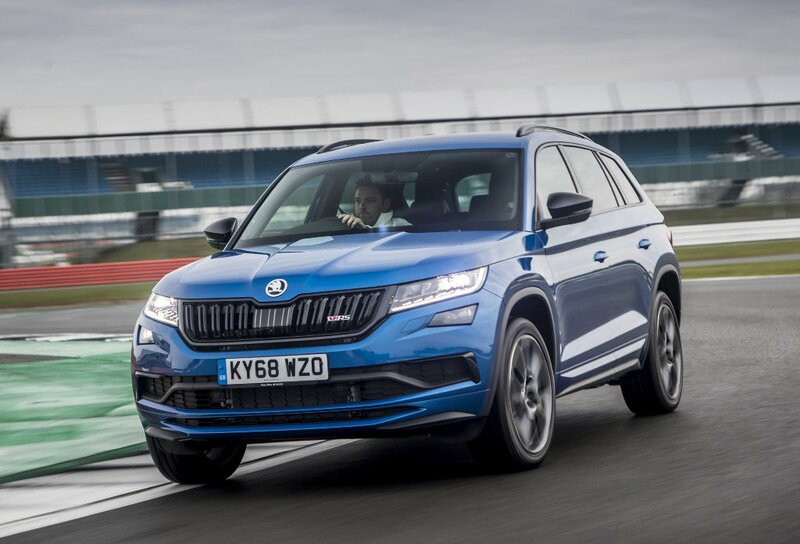 Recently, Škoda took their range-topping Kodiaq SUV and pebble-dashed it inside and out with vRS dust, which brings more performance and sporty style to an already appealing mix. It marks the Czech brand’s first attempt at making a truly sporty SUV. Putting a much-respected performance badge on a large family SUV is a bold step; it's hard not to be cynical about whether the Škoda Kodiaq vRS truly deserves the initials that have seen so many enthusiastic drivers become converts to the Czech brand via the Octavia vRS. As if to demonstrate the sporty SUV's worth, Škoda used it to set a new seven-seat SUV lap record of the famous Nürburgring race circuit in Germany. The upshot: the vRS is definitely fast, and it certainly seats seven. But is that enough to make it a must-buy SUV for those who really enjoy driving? On the outside, the chiselled Kodiaq vRS doesn’t look overly dissimilar to the SportLine trim upon which the vRS is based. However, setting it apart are a set of striking 20-inch ‘Xtreme’ alloy wheels that fill the Škoda’s wheel arches to striking effect and are by far the easiest means of identifying the vRS model at initial glance. This is the first vRS to get the new ‘red’ logo, which removes the traditional green in favour of red, which Škoda says symbolises “sportiness and power”. Other touches include unique bumpers with the vRS trademark full-width reflector at the rear, red brake calipers, big-bore dual exhaust tips, red vRS badging on the nose and rear and plenty of gloss black trim for a more aggressive look. In Race Blue metallic paint, the overall effect is far from subtle. We already know just how classy and practical the Kodiaq is inside, but has the vRS makeover broadened its appeal – or has it compromised an already very good package? 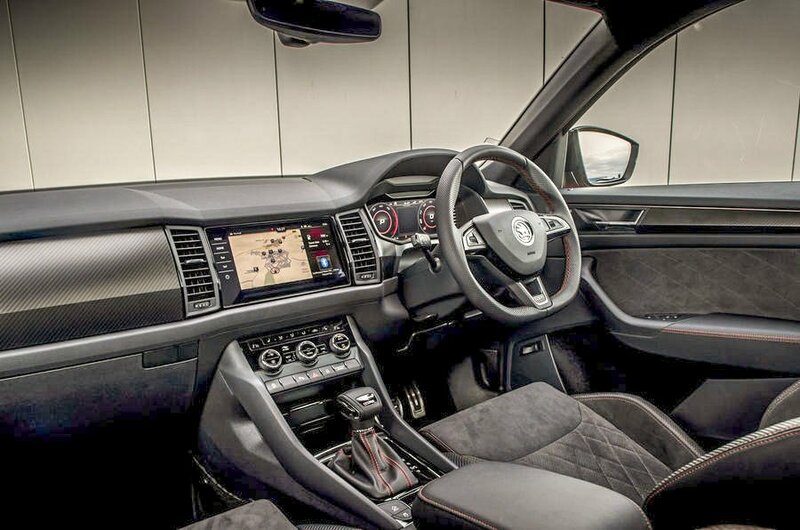 Climb inside and you’ll find generous use of carbon-effect trim, carbon-leather sports bucket-style seats, a heated flat-bottomed sports steering wheel, sports pedals and (yes, even) more gloss black. 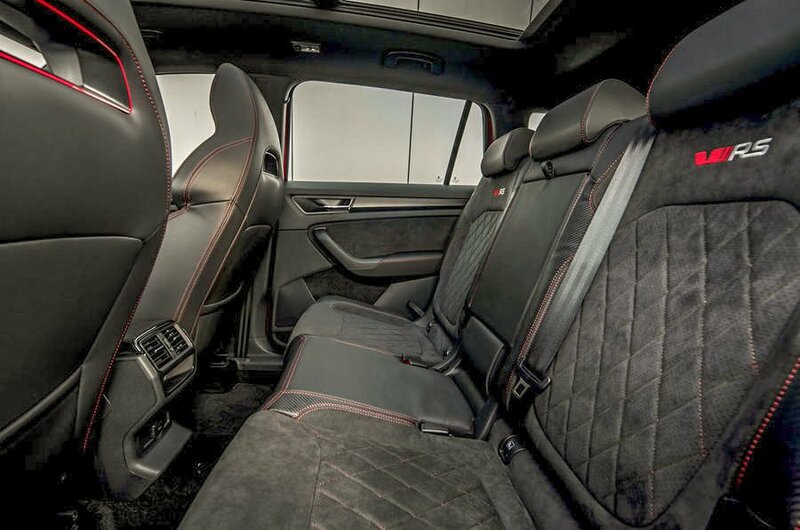 Red detail highlights are a general theme, but you’re far more likely to notice an inviting pair of sports seats and their Alcantara upholstery. 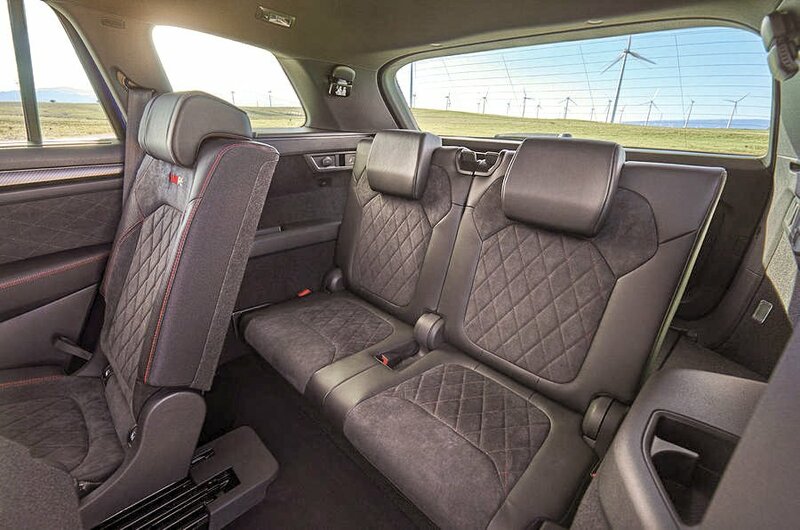 Other Kodiaq models can be ordered with five or seven seats but, despite the sports theme, the vRS is available only as a seven-seater. 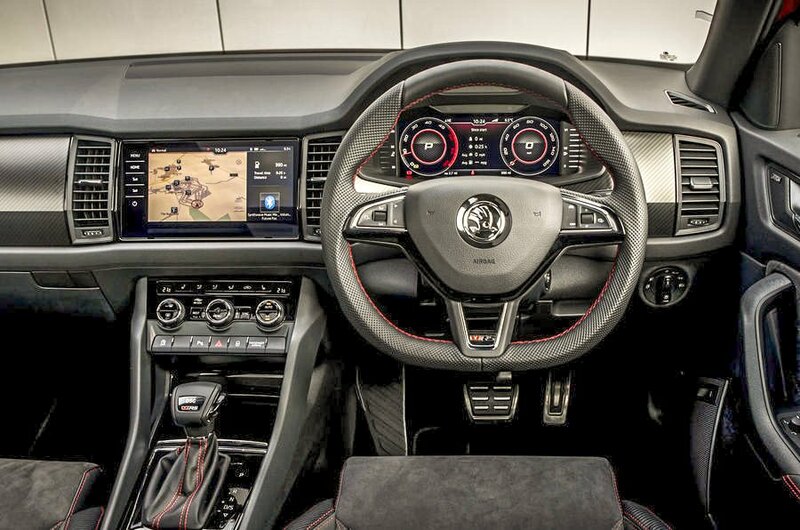 The VW Group’s excellent 9.2-inch touchscreen infotainment system and its Virtual Cockpit digital instrument panel is on the standard kit list, too. In the centre console are off-road and snow buttons for the transmission, these complementing the seven driving modes of Eco, Comfort, Normal, Sport, Individual and Snow. Regardless of your height, you’ll get a commanding view of the road ahead thanks to the raised driving position. The driver’s and front passenger seats also come with adjustable lumbar support, which is a nice touch. The second row of seats will be comfortable even for six-footers thanks to the generous knee and head room back there. There’s loads of space under the front seats for rear passengers’ feet and all cars get reclining middle-row seats for even more comfort. Admittedly, the central rear seat is a little raised and rather firm. Once you’ve folded down the row two seat backs, the seats slide forwards which helps anyone jumping into the rearmost seats. For adults to fit in row three you’ll have to push the middle row forwards, but even then, head and knee room will be cramped at best. Like most seven-seat SUVs, the rear-most seats are best left for older children or in-betweeners. When it comes to versatility, the vRS makes no compromises over any other model in the Kodiaq range. 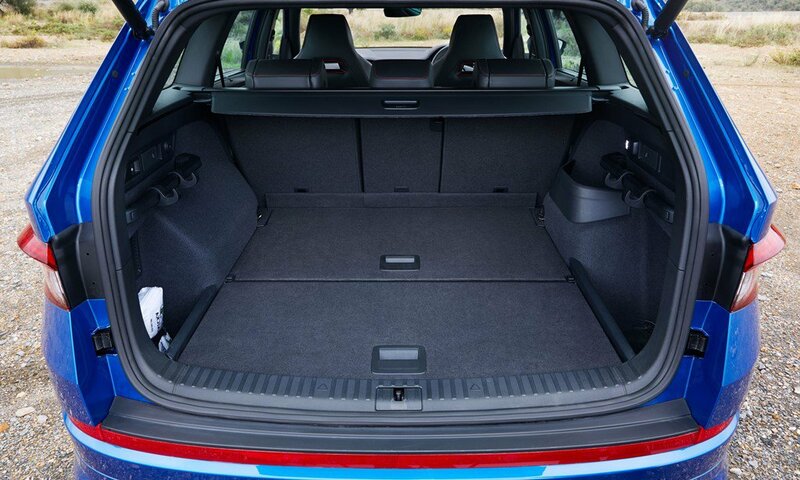 With every seat in use, there’s still 230 litres of boot space on offer, which is a similar figure to that of the VW Polo. If you need more than that, dropping the third row of seats frees up a total of 715 litres, and you can fold the second row if you need to carry something really bulky – in this mode there's a massive 1,950 litres of luggage space available. 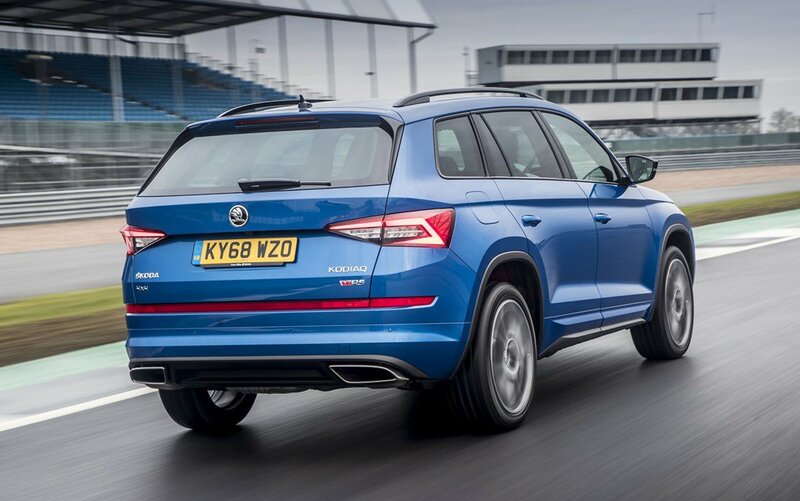 With an arsenal of grunty turbocharged V6 petrol engines available within the VW Group, Škoda has chosen an oil-burner as the motive force for the Kodiaq vRS. An odd call? Not entirely. Škoda’s reasoning is that diesels still rule in this market segment even if it’s dropping off elsewhere. Plus it has the potential for easy-going performance and reasonable economy, which already fits well with the standard Kodiaq’s target market. 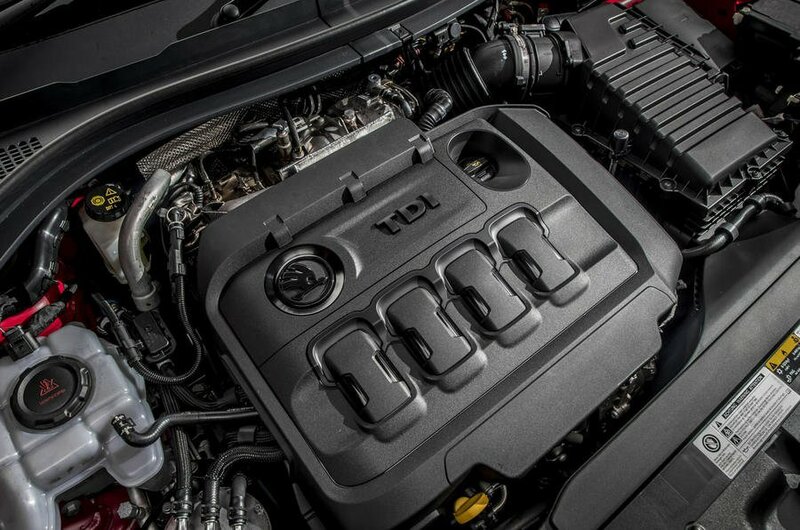 For sheer effectiveness, the choice of a four-cylinder, 2.0-litre bi-turbo TDI engine is easy to understand. Its 237hp is promisingly strong and its 500Nm of peak torque is stronger still. Performance-wise, it’ll do 0-62mph in seven seconds, peaking out at 136mph. It is paired with a seven-speed DSG transmission that serves a fine spread of ratios to all four wheels, the rear axle engaged on demand by an electronic clutch; up to 85 per cent of the torque can be directed to an individual wheel. Electronic differentials are provided for both axles, and in an effort to counter the rather unedifying sounds of a strong diesel, the vRS has ‘Dynamic Sound Boost’, which alters and adds to the exhaust note using signals from the engine management, adjusted to suit the chosen driving mode. With a driver on board, the Kodiaq vRS is nearly two tonnes of SUV, so it’s not lightweight performance special. However, the 237hp diesel suits the sensible performance approach very well indeed; it’s still quicker than the majority of cars without ever being scary. In addition to adaptive dampers, 20-inch wheels and wide tyres, you get what Škoda calls Progressive Steering. This gets faster the more you turn the wheel, so the vRS feels stable in a straight line but requires less working of the wheel through the twisty bits. 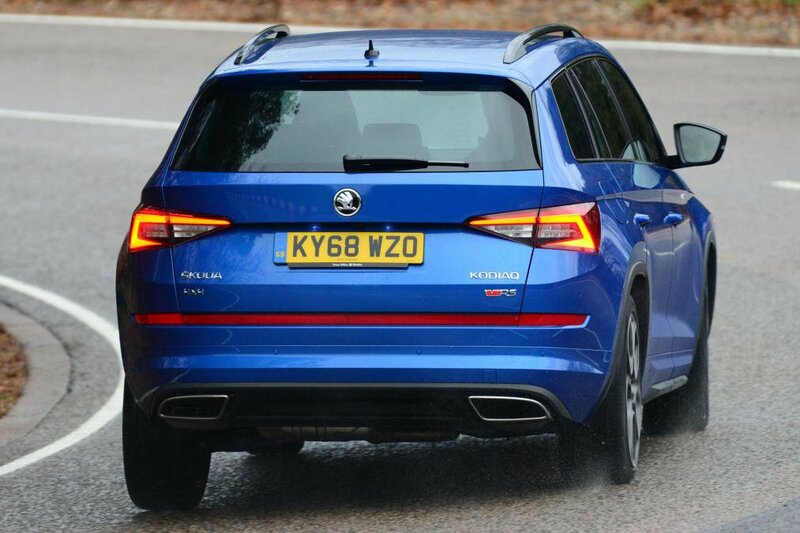 Grip levels are predictably high, but the Kodiaq vRS is also surprisingly well balanced; you can really feel power being directed rearwards to stop it from just pushing wide at the front. ...as there are only 300 examples coming to the UK during 2019, it's safe to say that Škoda understands just how narrow this niche really is. With a direct cost or ownership that pits the Kodiaq vRS against premium rivals as the Land Rover Discovery Sport, BMW X3 and Mercedes GLC, you'll need to be a big fan to justify choosing the sporty Škoda SUV. Still, the Kodiaq vRS is a well-equipped SUV that also doubles as a more-than-capable family shifter. Not only is it quick, it retains all the practicality and space that has already made the regular Kodiaq so appealing so so many. Browse our latest top leasing deals on the Škoda Kodiaq vRS.